We have a core math program that we love (Right Start Math). However, I wanted to find a resource to provide extra challenge (and a dose of fun) for our math time. We found Beast Academy and we are loving it! This program is brand new and only covers 3rd and part of 4th grade so far. Eventually the program should have 2nd-5th grade. 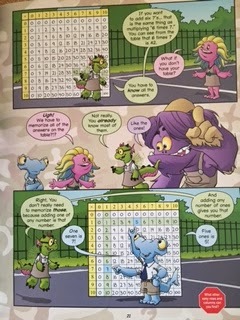 Beast Academy has a comic book for a text book. This book follows the beasts who attend Beast Academy as they learn about math and learn to apply mathematical concepts. It is fun, witty, entertaining, but teaches some in-depth concepts. The program also contains a workbook for the student which has practice problems that build on the concepts introduced in the lesson. Each level has 4 parts with each part having both booklets, so for 1 year of math you would need 4 guides and 4 workbooks. The program is designed so that the student reads several pages in the comic book and then completes an entire section of the workbook in which that concept is practiced in multiple different ways. This is a supplemental program for us and not a main math program. The reason I do not use it as our main program is that math is not Curly’s strong suit (or mine either) and I want a more traditional program to introduce concepts. I also want a program that has more incremental practice. Curly and I read through the lesson in the guide. I read the comics to her as she follows along. Anytime a problem is introduced to the beasts, we stop and work the problem ourselves to see if we get the same answer. Once the section has been read, we go to the guide to complete the corresponding pages. There are often several pages (8-10) in the guide that correspond to the reading. I assign Curly one page at a time and she attempts the problems on her own. If she gets stuck, then we work them together. This program is more of a collaborative effort and I’m always ready to help Curly as she puzzles through some of the more difficult problems. I view this program as one that is teaching Curly how to think and how to view a problem from different perspectives. The guides are colorful and fun. The comics are funny while still teaching challenging math concepts. 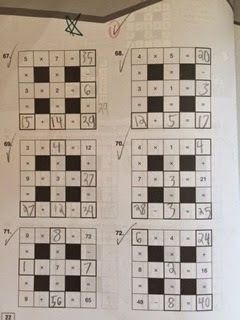 The practice problems introduce the same concept in many ways so you have to be able to manipulate the numbers in order to solve them. This program requires the student to puzzle through many of the concepts and discover how and why they work. In other words, it doesn’t always contain direct teaching but forces the student to move through the concepts and arrive at the answer through discovery. This program has taught Curly to think differently about math and understand that there are many ways to solve a problem. It has also taught her to persevere in solving difficult problems. I’ve also seen her ability to think logically and conceptually improve. It’s not just math – it’s how to think and discover and answer. 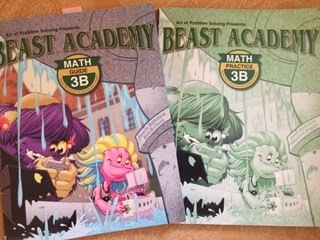 Beast Academy works well as a supplement in that it provides additional challenge and practice for concepts that were already introduced in our main math program (because we use this program slightly behind our main program). 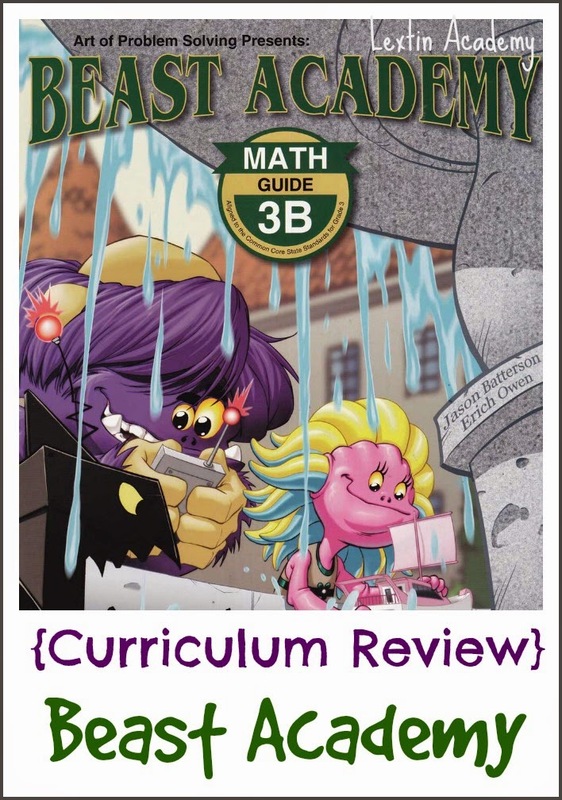 Therefore, Curly has already been taught most of the concepts in our core math program and then we use Beast Academy to flesh out the concepts and dive into them more deeply.